It's not bad looking, but the new CT5 needs more. Caddy just revealed the CT5 sedan in what's essentially the replacement for the aging CTS sport-luxury sedan. The brand is struggling with sales and identity, having killed off the ATS sedan, planning to end the CT6 sedan, and introducing the so-so XT6 crossover. Cadillac also ditched their new New York HQ to return to Detroit, as well as reworked their naming system to be based on torque numbers. We're just not really sure what the brand is doing. They seem to be shooting in the dark because no one can seem to make sense of the direction of the American luxury brand. Now, the CT5 sedan bows with more drama than the XT6 crossover did, but is the new sedan good enough to change the direction of the brand? We certainly have our doubts given the bizarre things Cadillac has been doing over the past year. Conservatively designed, the CT5 looks thicker and less sophisticated than the CTS. The new CT5 sedan falls in line with the current naming scheme, and it's meant to fill the mid-size luxury sedan slot for the brand. The CTS isn't selling particularly well in its final generation, dropping from its all-time high of just over 32K units sold in 2013 to a mere 11K in 2018. The new car, at least from the profile and front 3/4 view, seems almost crossover-like, which may or may not be intentional. It's just not nearly as fetching as the slick CTS, in our opinion. The brand has been struggling to sell its vehicles with only the big Escalade and XT5 crossover selling respectably. The CTS is the brand's best-selling sedan, despite the fact that its sales numbers can't keep up with sedan offerings from the German and Japanese luxury brands. And since GM stopped providing quarterly sales numbers, we don't know how the CTS is doing in 2019. We're guessing it's more of the same. So, can the CT5 turn things around? We have our doubts, despite the fact that the power numbers look pretty good. Under the hood are two engines, a 2.0-liter turbocharged inline-four and a twin-turbo 3.0-liter V6. 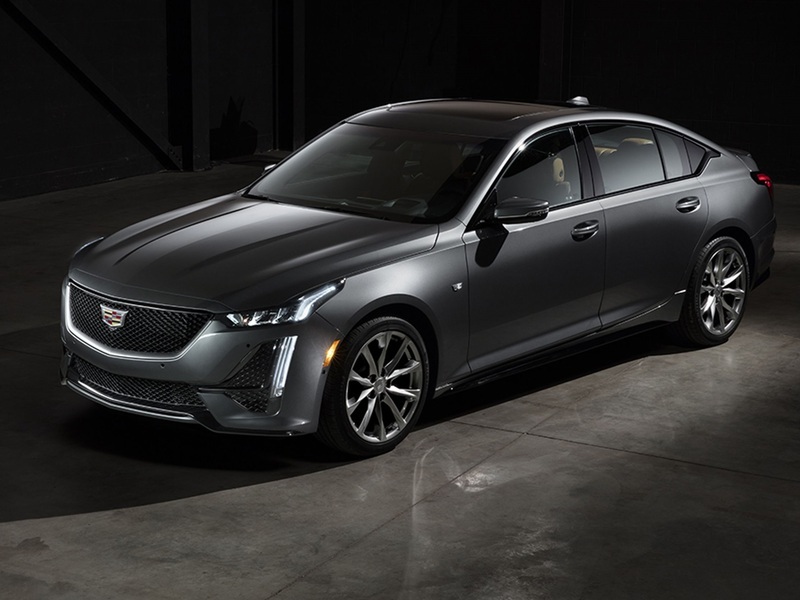 We don't know how much output will be delivered, but they should be more than the current CTS: 268 horsepower and 295 lb-ft of torque and 420 horsepower and 430 lb-ft of torque, respectively. Both engines will be mated to a 10-speed automatic, and AWD will be available. With the exception of more dramatic taillights and exhaust pipes, it looks like the CTS from the back. We don't know much about the car's tech and interior, but Caddy did show us one shot of the cabin. It looks like the CUE system's latest version (if it will, in fact, be called that) gets a rotary control knob in the center console, a-la BMW and Audi. At least they're continuing to try to make the infotainment system better and better because the original CUE sucked. There's not much else we can decipher from the photograph. Look for more details to emerge at the New York Auto Show this spring. Because there's nothing really revolutionary about Caddy's mid-size sedan, it's hard to say how much change it will make in terms of sales or brand perception. Cadillac needs more than this to succeed.